Showing results for tags 'carplay'. Has anyone tried this yet? I set up an appointment Friday to have the firmware in my stereo updated and will be ordering the 2.5 HMI module tonight to see if this actually works. See a lot of questions asked about this and not a lot of set info on the upgrade. Hope this helps even anyone trying to set it up. **READ ALL INSTRUCTIONS AND WATCH ALL VIDEOS PRIOR TO ATTEMPTING PURCHASING OR INSTALLATION** Apple CarPlay / Android Auto functionality is not supported in any 2014-2015 (Many 2016) Silverado/Sierra’s. This is due to neither application being available from Google or Apple when these vehicles being built, therefore not an available option during these model years. The following instructions are designed to simplify the process as much as possible. Three things are required for this upgrade (ONE) Radio Module, (ONE) HMI Module, and (ONE) USB Hub 2016+. Search around for the modules, they are available for purchase from many different locations. EBay, totaled vehicles, junkyards, or other various websites to find them. AGAIN, if the part numbers are not listed below DO NOT purchase them. It is highly encouraged to not try and cut corners with purchasing part numbers of modules not listed as they cannot be flashed to work properly. **DISCONNECT THE BATTERY PRIOR TO INSTALLING FRESHLY UPDATED MODULES** TOOLS REQUIRED: Trim Removal tool 10 mm Socket 7 mm Socket PARTS REQUIRED USB HUB P/N 13519224 (BLACK) P/N 13509943 (WHITE) HMI Module USE ONE OF THE BELOW P/N’S IF YOUR TRUCK CAME FROM THE FACTORY WITH NAVIGATION. ONLY REQUIRED TO PURCHASE ONE P/N. 84006103 84048396 84096817 84156701 81431943 84296482 USE ONE OF THE BELOW P/N’S IF YOUR TRUCK CAME FROM THE FACTORY WITHOUT NAVIGATION. ONLY REQUIRED TO PURCHASE ONE P/N. 84096815 84156699 84131941 84296480 84004948 84048398 84131941 84296480 RADIO MODULE USE ONE OF THE BELOW P/N’S IF YOUR TRUCK CAME FROM THE FACTORY WITH BOSE. ONLY REQUIRED TO PURCHASE ONE P/N. 84062073 84293226 13506371 23402903 USE ONE OF THE BELOW P/N’S IF YOUR TRUCK CAME FROM THE FACTORY WITHOUT BOSE. ONLY REQUIRED TO PURCHASE ONE P/N. 13506387 23402909 84062056 84293243 Once acquiring the parts you can now send them to be flashed. These modules will be flashed to your VIN and will then be plug and play. Copy the link and follow the prompts. http://www.whiteautoandmedia.com/index.php?page=shop.product_details&flypage=flypage.tpl&product_id=98&category_id=44&option=com_virtuemart&Itemid=54 If you have followed all the directions up and to this point, select yes for hardware match. You can chose if you would like the maps updated on your NAV if you so choose. You will be emailed your order number from WAMS, this is EXTREMELY IMPORTANT. You will be required to ship your parts either FedEx or UPS, they will not accept packages from USPS. You will need to write your order number on the box to ensure your order is properly handled. Turn around is approximately one week from shipment to return. ONLY ship your (ONE) Radio Module and (ONE) HMI Module. Maintain your USB Hub. Once you have received your parts from WAMS you can begin installation. Disconnect your battery prior to installation. To install the radio module watch https://www.youtube.com/watch?v=I2MYuuyqLrs. For the purpose of this install start the video at 1:00. Stop the video at 2:04, the radio module is visible with a green connector on the far left. Simply begin disconnecting all of the connectors plugged into the module, once all are removed you can slide the module out of the dash. It is retained only by the tension of the cables plugged into it. Replace with your new module, you can now continue the video and finish putting the dash back together. Stop the video at 4:10. To install the HMI Module watch https://www.youtube.com/watch?v=sFe2gwlOsD4. Stop the video at 2:00. The module being described behind the crossbar is what you are replacing. Remove all connectors, the module is retained with a plastic clip on top. Installing the module along with the glove box, is self explanatory. Take note of the plastic tabs on the sides of the USB Hub you are preparing to install. Those tabs can be depressed with a dental pick and gradually removed out of place. Once removed, disconnect the harness and reconnect. Installation is now complete. You can now reconnect your battery and start your vehicle. Initial start up might take a few seconds to initialize, and temperature defaulting to 32 degrees is normal. Android Auto and Apple CarPlay require hardwire connection, so to test functionality it needs to be connected to the newly installed USB hub. MVI Inc (https://www.gm-navigation.com/) offers kits and other customization options if the above is not something you feel comfortable acquiring on your own. Hope this helps, should be pretty cut and dry. There might be other methods, but this was the cheapest I discovered. If you have any questions don’t hesitate to ask. 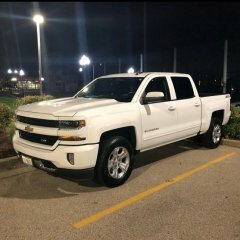 Having issues with booth the Carplay function and Buetooth software in 2016 Silverado Z71. Started with the Carplay function no longer connecting. The carplay app no longer shows on the MyLink display screen nor does the vehicle mylink connection show on the iphone 8 plus device. The phone does an endless search for a vehicle with carplay.. Have tried new IOS USB cable and still no connection. The voice activation feature works when connected but only for phone calls. No other media or apps within the iphone show on the Mylink display screen. Then the automatic bluetooth concection stopped. Once the bluetooth automatic connection stopped all music and other media source from the iphone stopped.. I can manually delete the bluetooth connection and manually connect each time i enter and start the vehicle.There is on iphone option as a media choice on the menu with in the MyLink system. I have been to the dealer twice and they tell me its my iphone with out checking the mylink softwared or checking of updates. I have reset and disconnected all mylink features and bluetooth connections in the Iphone. i have done a network reset on the iphone. I have reset or rebooted everything I can with in the iphon except for a hard reset which will completely reset the iphone back to original settings. I have been to the Apple store and had them double check if there is any issues with the Iphone. All software is up to date there are no restrictions set on the iphone side. I have searched the internet for nay issues with Iphone and MyLink software. There have been some connectioning issues since the last IOS 12 update, I have done everything suggested to resolve these issues to no avial. It has to be an issue with the MyLink software. Was hoping someone has a solution or suggestion before returning to the dealership. I have a 2015 GMC Sierra Denali 1500. The truck has factory installed radio, navigation, touch screen etc. I am told I already have the I06 module, so why don't I have carplay? And why do I have to buy another I06 to add carplay? can't I just do a software update? I have a 2016 GMC Sierra capable of Android Auto and Apple CarPlay and have been playing with CarPlay now for a little while. Yesterday I borrowed a friends used Android to test Android Auto. I'd be interested in your opinions and I will share my experience. I have had iPhones for years now. I am deep in the eco-system as my home and work computers are also OSX. Switching is a daunting thought considering my iCloud Contacts are well curated and my Google Contacts are like the wild wild west. I digress. Generally I have some gripes. CarPlay and Android both require USB and Bluetooth connection to the head unit which is confusing, is USB not enough? I doesn't seem like I could, for instance, connect a secondary Android device for Android Auto that is connected to WiFi via my phone or the car's 4G connect, and have my iPhone connected to the Bluetooth for Siri or even just for phone calls. I would be completely fine with sacrificing the Siri integration from the iPhone if I could get bluetooth audio for phone calls. Maybe I am not doing it right, if you have figured that out let me know. The touch screen is great for a truck head unit. I don't expect anything near what one would get on a new smartphone and I have heard the processor on this newer head unit is faster than the older models which is much appreciated when navigating interfaces. Also, the audio quality for phone calls is superb. Coming from a few year older GTI, people that don't even know I've upgraded don't ever notice I am on the road talking to them anymore. Spot on. After playing with CarPlay I can say that Apple Maps is much nicer to look at than the standard navigation. Apple hasn't convinced me that it's Maps application is ready for the prime time though. IMHO after reading countless articles and having iPhones back when Google Maps was default -- they never should have gotten into the Maps game. That is arguable, and should, theoretically, get better as they are in development of a car. Phone integration with Siri is fantastic as well. Spotify on CarPlay is a delight to look at. Again miles away from the Media interface on the IntelliLink. Android auto -- wow. Whereas it's obvious Apple too the iOS idea with big icons -- and it works on the head unit -- it looks like Google went from the ground up. They took their material design philosophy and applied it to the head unit interface. I have to say it is impressive. Overall the user interface is gorgeous to look at. Navigating around to the different areas, Music, Navigation is a breeze. Ok Google mic is always in the top right corner. Icons are clear. Minimal buttons when not needed. Intuitive controls. If it sounds like I am not giving Apple credit here, they have a system and it works. It's worked for years on my phone so I get that. This is my first intro into the new design of Google's apps and I have to say I am staggered. Google maps on the IntelliLink is a marvel. Incredibly smooth. Design refined over years of Google Maps owning (IMHO) the directions arena. My conundrum is with the whole USB/Bluetooth situation. Android Auto for certain does not work unless you have it connected via USB & bluetooth. Therefore it's not like I can keep an older Android without a cellular plan in the glove box just for Android Auto and still have any integration with the iPhone 6S. That is a huge bummer. I would have no issue buying even a used Android with a cracked screen since I don't need the screen. I'm in a touch position here because of how nested I am in the Apple world and how attractive having Google Maps on that 8" screen. I don't think there is anything else better to look at on that screen. What is your experience? Have I missed anything? I don't know how many 2016 trucks are out there, but I was curious if anyone else was having issues with choppy audio playback from Apple Carplay. If I have my iPhone plugged in via Lightning cable, the audio playback is extremely choppy, and it doesn't get any better with time. Also, the CarPlay apps will take several seconds to respond to any touch, which effectively renders the feature unusable. Has anyone else experienced similar issues? I know the feature is brand new with the MyLink system, but I'm surprised at just how buggy it is. It's not a huge bugaboo for me, as the Bluetooth works fine, so I figured if I get nothing here, I'll bring it up at my first oil change. -I have the 40/20/40 bench, and I am utilizing the USB port in the flipdown console -Pandora plays just fine when connected through the same Lightning cable in the same port -Have tried multiple Apple and other certified Lightning cables -Currently running iOS 9.2 on my iPhone 5s -Have cleaned my Lightning port on the phone to no avail -Have 2.2GB free memory on the phone -The music I am attempting to play is stored on the phone I have yet to try another phone, but if anyone has any other ideas or similar experiences, I would appreciate the input. Thank you. So my truck is at the dealer to have the radiator replaced under warranty, in relation to a TSB. I always get a loaner vehicle from my dealer and this time they gave me a 2016 Sierra SLE All Terrain. Nice truck, not quite the SLT All Terrain like my 2014. Well this one has the updated Intellilink system with Apple CarPlay. So I have been testing it out and playing with it. Few reactions right off the bat: 1. The latest MMI system is SO much faster than my 2014. Going between menu's is so much quicker. With my 2014, there is a noticeable lag when pressing a screen option. GM must have upgraded the hardware to include a better processor. Should have been the case in 2014, but live and learn I guess. 2. Backup camera seems to be a lot crisper than my 2014. 3. Apple CarPlay add's some nice features, I would see myself using it. But when it interupts my music to read off a text message, I get annoyed. Hah And finally here is a short video I made of the new MMI system. Enjoy. Bring Android Auto/Apple Carplay to 2014-2015 Trucks? As I'm sure many of you folks are aware, they're adding a "projection" option to the 2016 Silverados and Sierras within Mylink/Intellilink. Do any of you know if it would be possible to add these features to a 2014-15 Silverado via a software flash, HMI swap (as some people already do to upgrade to nav), or other means? Any info or insight would be appreciated. I don't care much for factory navigation, but having Google Maps on my truck's display would be awesome. Zane Merva Executive Editor, GM-Trucks.com 9/24/15 Chevrolet is using the State Fair of Texas to take the final wraps off of the newly refreshed 2016 Silverado. With the public debut also comes new details about the models added features, lighting, and transmission. Chevy's new 8-speed transmission for up-level trims and LED lighting are among the biggest news. HID headlights standard on WT trims, and LED headlights for High Country also are surprising. Here's the full details of the important stuff in bullet form. Full details of 2016 Silverado Advanced lighting is focus of exterior redesign HID lights are standard on WT, LED fog lights standard on LT Z71, and LED headlights are standard on LTZ and up trims. Each trim level has it's own grill: WT = Chome horizontal grille, with black inserts : LT & LTZ = all chrome : High Country =Chrome with unique inserts and body colored bumper All trim levels feature LED running lights, parking lights, and turn signals. LTZ, LTZ/Z71, and High Country feature full LED lighting, from headlights to taillamps CarPlay compatible at launch, Android Auto will come later via software update Forward Collision Alert, Lane Keep Assist, and IntelliBeam high bean assist are options New remote locking tailgate available Wireless phone charging variable on LT and LTZ double cab and all crew cab models High Country avaliable with power articulating running baords 8-speed transmission standard on all 6.2L engines, and 5.3L engines with LTZ and up trim levels. We'll be driving the all new 2016 Sierra and Canyon Diesel in just a few weeks. More information on the 2016 Sierra should be out later this week. Update 1: The Chevrolet Communications Manager for Silverado posted this photo of a "WT" trim level on Facebook. Note it includes LED running lights, turn signals, and HID lights - all standard. Chevy's new 8-speed transmission for up-level trims and LED lighting are among the biggest news. HID headlights standard on WT trims, and LED headlights for High Country also are surprising. Here's the full details of the important stuff in bullet form. Full details of 2016 Silverado Advanced lighting is focus of exterior redesign HID lights are standard on WT, LED fog lights standard on LT Z71, and LED headlights are standard on LTZ and up trims. Each trim level has it's own grill: WT = Chome horizontal grille, with black inserts : LT & LTZ = all chrome : High Country =Chrome with unique inserts and body colored bumper All trim levels feature LED running lights, parking lights, and turn signals. LTZ, LTZ/Z71, and High Country feature full LED lighting, from headlights to taillamps CarPlay compatible at launch, Android Auto will come later via software update Forward Collision Alert, Lane Keep Assist, and IntelliBeam high bean assist are options New remote locking tailgate available Wireless phone charging variable on LT and LTZ double cab and all crew cab models High Country avaliable with power articulating running baords 8-speed transmission standard on all 6.2L engines, and 5.3L engines with LTZ and up trim levels. We'll be driving the all new 2016 Sierra and Canyon Diesel in just a few weeks. More information on the 2016 Sierra should be out later this week.